Squillaci's 8th minute winner against them in February. What? You don't? Photo: Guardian. GET IN, AARON! Photo: Guardian. Cesc Fabregas's thigh injury, picked up in training before last week's clash with Manchester United has not fully healed, which means Aaron Ramsey will make a second consecutive start in the midfield. This start, will of course, be more dramatic than the last start, given what happened to Ramsey in Arsenal's last trip to the Britannia last February. Arsenal v. Stoke has developed into quite the rivalry over the past two seasons, with Ryan Shawcross's injuring of Ramsey adding fuel to the fire that was already burning given the two sides' clash of approaches to the game. Needless to say, the feeling of hatred between the two sides will be palpable. More questions linger around the back four. Johan Djourou left last week's match against United after turning over his ankle and faces a late fitness test. Apparently, his last test was positive, so he could get the start. Should he not start, Thomas Vermaelen is back in the squad and ready to be penciled in, but we all know he's not match fit, having played 90 minutes of football once, for the reserves, since early September. But I have the feeling I know the answer most Gooners would supply to the question "would you prefer a recovering Vermaelen or any Sebastien Squillaci?" Gael Clichy looks less likely to start with a hamstring injury, so we may see Kieran Gibbs again on the left. It's been a while for him. Samir Nasri has not recovered by the hamstring knock that took him off at halftime last week, so all signs point to a start for Andrei Arshavin on the left. Abou Diaby remains out with a calf injury. Predicted squad: Szczesny, Sagna, Koscielny, Djourou, Gibbs, Song, Wilshere, Ramsey, Arshavin, Walcott, van Persie. Are you ready for some throwball? Photo: Guardian. Stoke City have no fresh injury concerns at the moment and are potentially set to welcome right back Andy Wilkinson to the side after a dead leg forced his removal from last week's 0-0 draw at Blackpool. 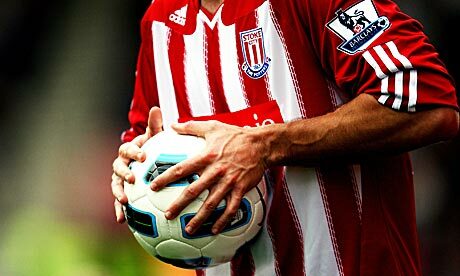 The Potters, however, have four long term injury concerns. Midfielder Matthew Etherington is out with a hamstring injury that could force him to miss the FA Cup Final, both Ricardo Fuller and Mamady Sidibe are out for the year with Achilles injuries, and Danny Higginbotham is out for the season with ligament damage in his knee. The fact that Stoke are closer to silverware than Arsenal at this point has to sadden any Gooner. Even a loss in the FA Cup Final for the Potters would mean European qualification, if Manchester City finishes in fourth place and takes a Champions League spot. Stoke are also in the hunt for their first top-10 finish in over 35 years. Glenn Whelan will be making his 100th appearance for the club. Ryan Shawcross is making his 150th. Arsenal will be looking to win back-to-back league matches for the first time since beating Wolves and Stoke in February. Despite their struggles in winning lately, Arsenal still have the best road record in the league, picking up 30 points from 17 road fixtures. Robin van Persie has scored in seven consecutive league road matches. Stoke come into this match having kept consecutive clean sheets in their last two matches, though they were against relegation threatened Wolves and Blackpool. They have not kept three clean sheets in a row in a span of 13 months. Stoke have only lost once in their last six league matches, 3-2 at Tottenham. Stoke have not lost a match in which they scored first this season; last year, Stoke opened the scoring against Arsenal within the first ten minutes in both matches (league and FA Cup) played at the Britannia. Arsenal won the reverse fixture 1-0 in February, thanks to an early goal from Sebastian Squillaci and also won both league fixtures last season. At the Britannia, Arsenal scored two late goals to win 3-1, rallying for the honor of the injured Ramsey. Ramsey scored against Stoke last year at the Emirates in a 2-0 win. Arsenal have played Stoke City in five league matches since Stoke's recent promotion to the Premier League. In these five matches, Arsenal has won four of the them, including all three at the Emirates and last year's trip to the Britannia. have never really had a pleasant trip to the Britannia. Clearly, this must be rectified. Photo: Daily Telegraph. Stoke City have scored a higher percentage of their goals (48.8%) from set pieces than any other side in the Premier League. This also happens to be Arsenal's biggest defensive weakness. Stoke have only received two red cards this season. Guess who has both? The referee is Lancashire-based Mark Halsey. Last year, Halsey took charge of Arsenal's season-opening 6-1 win at Everton, then announced he was suffering from lymphoma of the glands and had a cancerous tumor removed from his throat. He returned to top flight refereeing this season. Halsey has taken charge of two Arsenal matches this year, both clean sheet wins: 2-0 at Wolves and 3-0 over Ipswich Town in the Carling Cup semi-final second leg at the Emirates. For Stoke, Halsey has taken charge of a 2-0 win over Fulham in the Carling Cup, a 2-0 win over Liverpool, a 1-1 draw with Cardiff in the FA Cup, and a 1-0 loss at Birmingham. Halsey has shown only one red card this season, to Liverpool's Lucas, for a second yellow. It was in the 90th minute of the aforementioned Liverpool match at the Britannia against Stoke. This round of fixtures is the reverse of those which were scheduled to be played the weekend of December 18-20. Many of them were postponed due to a major snowstorm in England, including Arsenal v. Stoke which was moved to February. Frank Lampard had the winner at the Bridge against United. hopes at the title alive. Photo: Guardian. The obvious highlight fixture of the weekend is at Old Trafford and will take place right after Arsenal's match at Stoke, as Manchester United hosts Chelsea in a top of the table clash. United leads Chelsea for the league lead by just three points with three matches to play, with the goal difference equal between the two sides. United plays Blackburn and Blackpool in their final two matches of the year, Chelsea plays Newcastle and Everton. Given those future fixtures, I have the feeling that at least a point could all but mathematically seal another title for United. There's one other match on Sunday, earlier than Arsenal's start, as Wolves host West Brom in a huge West Midlands derby with relegation implications. Wolves are a point from safety out of the drop zone, West Brom are eight points clear with three matches to play, essentially securing their safety with a big win against Aston Villa last week. As for the Saturday kick-offs, there's no early match again this week; it's the final round of play in the Championship, so all second tier matches start simultaneously in that time slot. Leeds United has an outside shot of unseating Nottingham Forest for the last playoff spot (Leeds is at already promoted QPR, Forest is at Crystal Palace.) Leeds will need to overturn a six goal deficit in goal difference to do it, though. Back to the top flight, in the 10:00 a.m. time slot Saturday: Wigan (in the drop zone on goal difference) is at Aston Villa, Sunderland is at Bolton, Manchester City is at Everton, Birmingham is at Newcastle, and Blackburn is at last place West Ham. In the late match, Tottenham hosts Blackpool. On Monday, Fulham hosts Liverpool.